The term “backchannel” was coined in the field of Linguistics in the 1970’s to describe listeners’ behaviors during verbal communication. It is commonly used these days to describe the behavior or conversation going on in social media while a speaker is making a presentation. In some conferences the majority of the people listening may be actively Tweeting throughout a speech. Like it or not, managing the backchannel has become a part of presenting, in person or online. I’ve certainly seen conferences overuse backchannel twitter streams and the like to the point where they overwhelm and distract rather than aid. There needs to be a balance and I don’t think making a Twitter stream a competing channel makes sense for anyone. Having said that, I think it can be used wisely as it allows people who can’t attend to share and extends the reach of your presentation far beyond the confounds of the local hotel ballroom. For at least a year or so many speakers have made liberal use of the Twitter hashtag as a way for attendees and non attendees alike to group, filter and sort all of the conversations happening at a conference or during a webinar. As the backchannel has evolved into the norm, a new set of tools is cropping up that allow presenters to participate in the backchannel conversation even while they are presenting. For example,Keynote Tweet for Mac and PowerPoint Twitter Tools for the PC are presentation add-ons that allow speakers to embed tweets into their presentations and automatically have those tweets pushed live when the slide is revealed. The tweet content is actually in the presenter notes in the software so it won’t be seen by the audience and may simply contain a retweetable statement related to the slide or point. What this does is make it very easy for the content to be shared and retweeted by those in attendance and publishes the key points for those that are not. PowerPoint Twitter Tools for the PC is actually a suite of eight free tools including tools that allow participants to do things like vote or take a poll and have the poll results pushed live to the slide on the screen. Just getting up and presenting is task enough for many a speaker, but hey, this is the world we live in, so get used to managing the backchannel as well as the frontchannel. 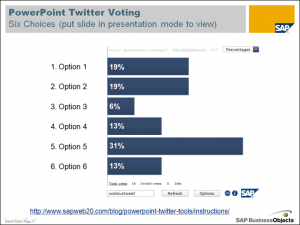 Free PowerPoint Twitter Tools – Presenters know that the social media backchannel has become a very important tool to manage. This tool automates tweets while you present. Quirky – This site bills itself as social product development. The idea here is users submit product ideas and then vote and influence the development and sale. Very interesting concept. 20 Tools for Tracking Social Media Marketing – Title says it all, a nice round-up of free and paid services for listening for social media mentions.